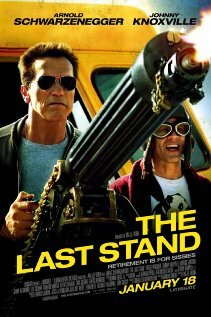 When I saw the first preview for The Last Stand with Arnold Schwarzenegger, I knew I would be seeing it the first week it opened. This is not just Arnold coming back to movies, but coming back in a big way! (Yes, I'm avoiding the obvious line!) In many ways, this is a typical Arnold movie, fast paced, funny, violent and a whole lot of fun! Yes, and Arnold does have his usual great lines,throughout the movie and the audience ate them all up. Johnny Knoxville was terrific too as a bit of a nut helping out the sheriff and I enjoyed Luis Guzman as the reluctant deputy. No movie like this can be any good without a decent villain and Eduardo Noriega as fugitive on the fly Gabriel, was delightfully cool and evil. One thing I enjoyed about the movie is that Arnold does acknowledge his age, but can still pack a punch! Saying any more may give away the plot. I can only say that I give this an 8/10 and would place it in my favorite top 5 Arnold movies.